It is lovely when someone you know passes on a great tip that saves you time or money, or is helping save resources. The whole issue about recycling comes up time and again and for me it is important to give something back I want my children to have a world to grow into, so I try to do what I can as I am sure you do to. 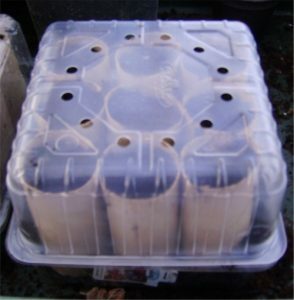 Here in the garden it is no different and during the winter you will see my greenhouse with bags of toilet roll tubes and tubs full of eggshells. WHY? Let me pass on to you some hints and tips for your garden. 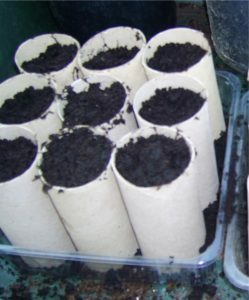 Well the toilet roll tubes come in handy for growing my sweetpeas and sunflowers and peas and really anything you want and then of course the empty plastic containers that strawberries and soft frut come in make excellent little propagators – no need really to go buying expensive bits of kit – which means more pennies to spend on your seeds!
. . . and here they are. As I write this I have Freddie – the cat ‘helping’ me to type in his own sweet way!!!
. . . and the eggshells? ah yes well they are for the slugs – a liberal sprinkling of broken eggshells around the base of your delicate seedlings helps to keep the slugs from munching the small shoots. . . . and it also means the birds in my garden dont die from eating poisioned slugs. You need to wash th eggshells and then pop them in the airing cuboard or somewhere warm to dry them. So there you are just a few good ideas for you to use in your garden.